‘A Cottage in the Country is a real feast for the senses. Get the coffee pot on, grab a pack of biscuits and let Maddie soothe your soul.’ – BestChickLit What do you do when your best friend has an affair with your husband of twenty-five years? Well, you pack your bags, grab half of the equity in the house you've both lovingly restored and run away to an idyllic little cottage in the country. 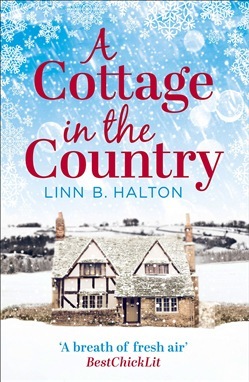 Only, it’s not quite so idyllic when 1) Rustic charm sounds rather romantic, but the reality is something else … 2) The heavens decide to open on moving day and the rain just keeps on coming Maddie Brooks grits her teeth and hires the highly recommended 'man who can', ex-soldier, Lewis Hart. As he rips out the very shabby, and decidedly not-so-chic kitchen, reality sets in. Not only is he the most abrupt person she's ever met, but the man is a Neanderthal! As the flood waters rise, and the village is cut off, everything that could possibly go wrong, does. Hitting the big five-o is the final straw. No presents, family or friends—just infuriating Lewis, who can’t leave because the flood has now cut off his exit. How on earth is she going to get through this and put her life back together? Can Maddie Brooks become that ‘fifty-and-fabulous’ woman of her dreams? Acquista A Cottage in the Country: Escape to the cosiest little cottage in the country (Christmas in the Country, Book 1) in Epub: dopo aver letto l’ebook A Cottage in the Country: Escape to the cosiest little cottage in the country (Christmas in the Country, Book 1) di Linn B Halton ti invitiamo a lasciarci una Recensione qui sotto: sarà utile agli utenti che non abbiano ancora letto questo libro e che vogliano avere delle opinioni altrui. L’opinione su di un libro è molto soggettiva e per questo leggere eventuali recensioni negative non ci dovrà frenare dall’acquisto, anzi dovrà spingerci ad acquistare il libro in fretta per poter dire la nostra ed eventualmente smentire quanto commentato da altri, contribuendo ad arricchire più possibile i commenti e dare sempre più spunti di confronto al pubblico online.